A very special family needs our help this year. Instead of thinking about typical New Year’s resolutions, the Flynn Family focuses on Mission Marcus. . . the preparation for Marcus Flynn’s full spinal fusion this coming May. Eighteen years ago, Marcus was born with Encephalopathy which caused his global and cognitive delay accompanied by multiple, complex medical issues. Through all of this, he’s never lost his infectious smile, simple enthusiasm for life and friendly personality. He quite simply reminds us that the best things in life are the people in our life. Marcus’s schedule has been filled with doctor and therapy appointments and hospitalizations for illnesses--unnecessary for healthy children. He and his family relocated to attend a school in an environment that truly focused on his potential. All of this is a lot for one child, one family to bear. And yet Marcus did it all with a smile on his face. Then, something new developed about four years ago. . . A curve in Marcus’s spine. After additional appointments and testing with the Children’s Hospital Orthopedic Specialty Clinic, Marcus was diagnosed with Scheuermann’s Kyphosis. Scheuermann’s Kyphosis describes a condition where the normally healthy, rectangular vertebrae of the back become wedge-shaped, causing the middle of the spine to curve forward abnormally, leading to rounded or stooped posture. 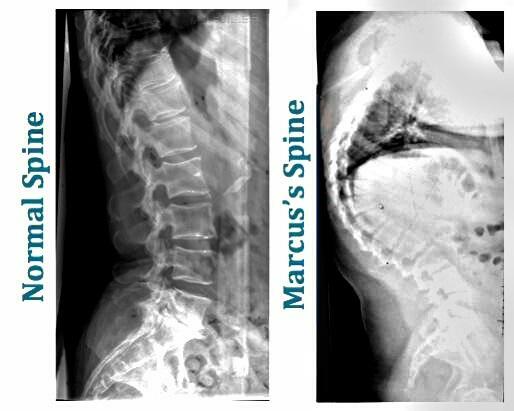 Heartbreakingly, in November 2014, Marcus’s updated X-Rays revealed that his spine’s curvature was at a medically astonishing 95 degrees. Doctors told his mother they were confident Marcus’s spine was slowly collapsing, and that the final option, spinal fusion, must be considered imminently. Four years ago, despite Marcus’s special needs, he was a jovial fun kid whose spirit was contagious--running, playing and having fun. Today, Marcus is a young man who yearns for these normal adolescent activities, but he can only sustain about 30 minutes of movement before needing to rest for hours. Pain medication has become routine for him, and his overall activity has declined significantly. With therapies and non-invasive treatments proving ineffective, a full spinal fusion is now Marcus’s final option. Marcus’s 95 degree Kyphosis stretches beyond current medical research and data as this astonishing curvature is extremely rare in adolescents. Such rarity pairs itself with the medically unknown and the continued fears of the inevitable deterioration. The surgery is scheduled for May 10, 2016, but the preparation has already started and the recovery will be extensive. Over the past six years, Tammy spearheaded events like An Evening of Elegance and Wishes in Wonderland to raise nearly $500,000 for Children’s Hospital of Wisconsin and Make-A-Wish Wisconsin. Now, Tammy needs our help in supporting Mission Marcus. First and foremost, support the Flynn Family with your thoughts and prayers! We know God has a plan for Marcus and we know that He does not give us more than He thinks we can handle. Marcus’s needs far outweigh what insurance will cover. Co-pays, deductibles and non-covered services will be substantial in addition to some parental loss of wages. He will also need in-home medical equipment, adaptive home and car equipment and other resources. 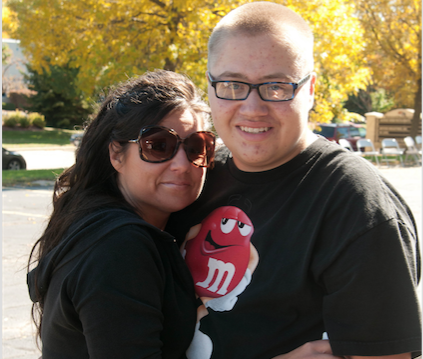 To learn more about ways to help or to follow Marcus along on his journey, visit our website www.missionmarcus.com. Hi Marcus, Karl and I were looking for a good cause to donate to in your great grandfather's name, Leonard. I know he would be happy to see you stand & walk so well. We love you and I think it would be nice to give the money to you. Jesus is always with you.